That’s great and all, except for the fact that they are made up scores. Gamespy gave the game 3 out of 5 stars. Game Informer gave the game a 7/10, they don’t even use stars. 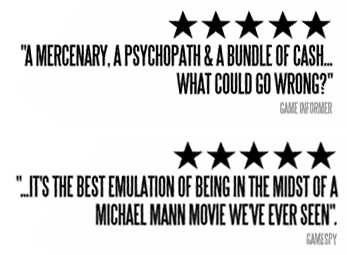 Also, the quotes are not taken from the reviews of the game. Gamespy made their comments in E3 2007 article. As for Game Informer, I’m not sure where it came from, but it didn’t come from the review. They also made up a 5 star score for Kotaku and quoted something from an E3 hands-on. You can view the official Kane & Lynch site here. man! these guys should run for president of the united states of america! they have the skills needed! If you have a problem with American Politics then you should leave this beautiful country. THESE COLORS DON’T RUN! HEIL AMERICA. DEATH TO LIBERAL SCUM. Why can’t they just accept that their game isn’t that great. Companies make crappy games all the time,why is this one any different. This is also a lot of trouble for a video game. Either way scandals in the video game world are semi exciting. Its time to see if gamers even care.